Research supported by the Kyushu Taiwan Studies Program focuses especially on politics, identity discourse and public culture in contemporary Taiwan. But we also seek to provide a platform for Taiwan-related research across all disciplines within Kyushu University. 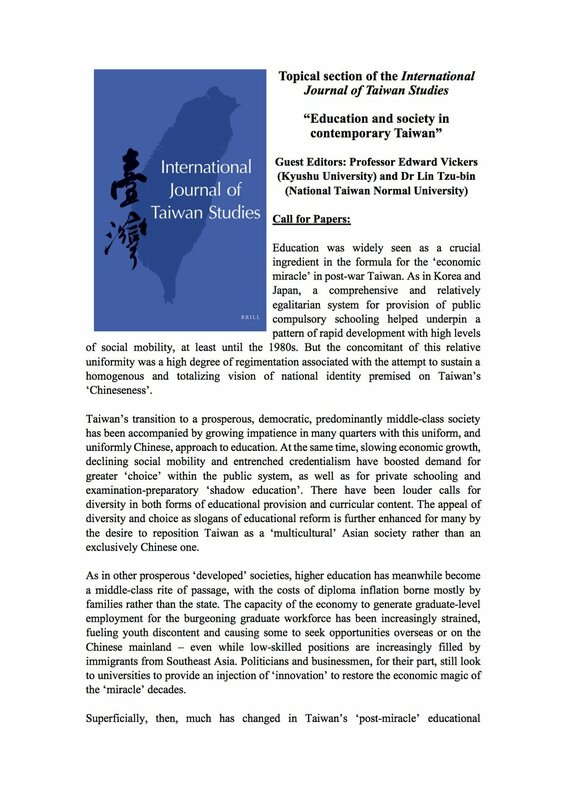 FORTHCOMING: TOPICAL SECTION OF THE INTERNATIONAL JOURNAL OF TAIWAN STUDIES ON ‘EDUCATION AND SOCIETY IN CONTEMPORARY TAIWAN’ - TO BE CO-EDITED BY EDWARD VICKERS (KYUSHU UNIVERSITY) AND LIN TZU-BIN (NATIONAL TAIWAN NORMAL UNIVERSITY). Publication scheduled for September 2020. 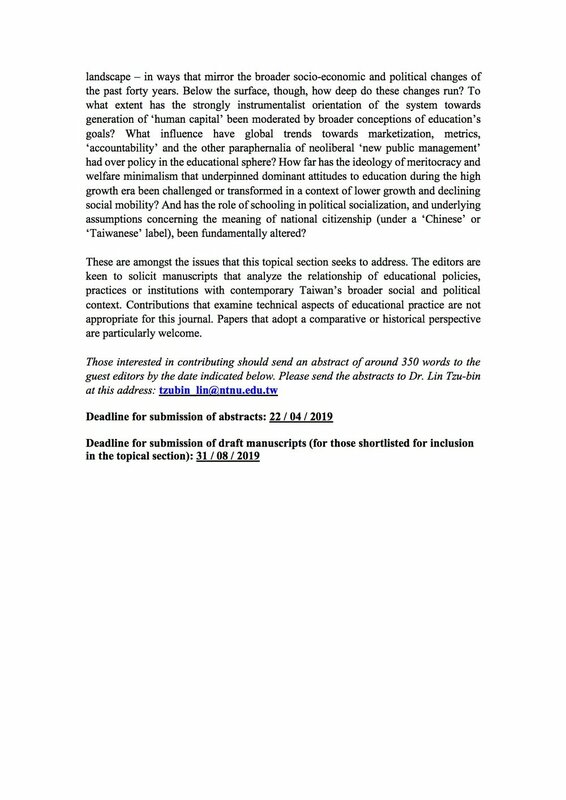 The call for papers is posted at the bottom of this page. Shiho Maehara (2017). ‘Lee Teng-hui and the formation of Taiwanese Identity’ in Peter Kang and J. Bruce Jacobs (eds) Changing Taiwanese Identity. New York and London: Routledge. Edward Vickers (2017). ‘Remembering and Forgetting War and Occupation in the People’s Republic of China, Hong Kong and Taiwan,’ in Patrick Finney (ed. ), Remembering the Second World War. New York and London: Routledge, 46-67. Edward Vickers (2017). ‘Altered States of Consciousness: identity politics and prospects for Hong Kong-Taiwan-mainland reconciliation’, in Annika Freiburg and Martin Chung (eds). Reconciling with the Past: Resources and obstacles in a global perspective. New York and London: Routledge, 122-137. Edward Vickers (2017). ‘All Quiet on the Eastern Front? Populism, Nationalism and Democracy in East Asia,’ Georgetown Journal of International Affairs, XVIII, No. II, 59-68. Maehara Shiho, Abe Yurika, Tsumura Aoi and Shinohara Shogo (trans.) (2016). Sai Eibun-Shinjidai no Taiwan e 蔡英文—新時代の台湾へ（Tsai Ing-wen: Taiwan in a new era); 東京：白水社. Japanese translation of Ying-pai 英派 by Tsai Ing-wen (Taibei: yuanshen圓神,2015). Paul Morris, Naoko Shimazu and Edward Vickers (eds) (2013). Imagining Japan in Post-war East Asia: identity politics, schooling and popular culture. New York and London: Routledge. Edward Vickers (2013). ‘Transcending Victimhood: Japan in the public historical museums of Taiwan and the People’s Republic of China,’ China Perspectives (French Centre for Research on Contemporary China), 2013/4, 17-28. Edward Vickers (2013). ‘Editorial: Chinese Visions of Japan: Official Narratives of a Troubled Relationship,’ China Perspectives (French Centre for Research on Contemporary China), 2013/4, 3-5.